Happy New Year to you too! I got the new iPhone 5 for Christmas. It will probably be upsurped by the iPhone 6 in January 2013. Happy new year to you Dufus! I sat her for a whole two minutes and I didn't come up with anything funny to say. HPPY NU YR 2 U 2, Dufus. No I have my laptop and my iPad with me too. Don't leave home without it. Awl the bst fr 2013 Nickster. That's okay. You have 365 days to work on it, Shawn. Thnks, Cheryl! I hope it's a good 1. 2013? Can't wait. Happy new year, Dufus! You won't have much longer, Indigo! 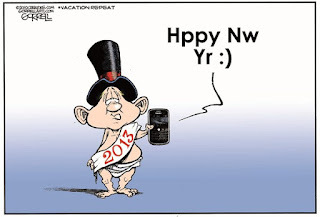 2013 already...? Have yourself a Happy New Year, Dufe. Thanks, Mike. It'll be happier when I can string a few words together in a post. LOL! Great pic Dufus. Happiest of New Year's to you and the Missus. And likewise my friend... consider the wish returned to YE. No more cancer! Sorry, I'm late to the party! Merry Christmas & Happy New Year! Thanks 500. Same to you, eh? And to you too, Ziva. Hope you and your hubby have a great year. Maybe we'll hear the pitter-patter of little feet? Um, no, it's too late for me.